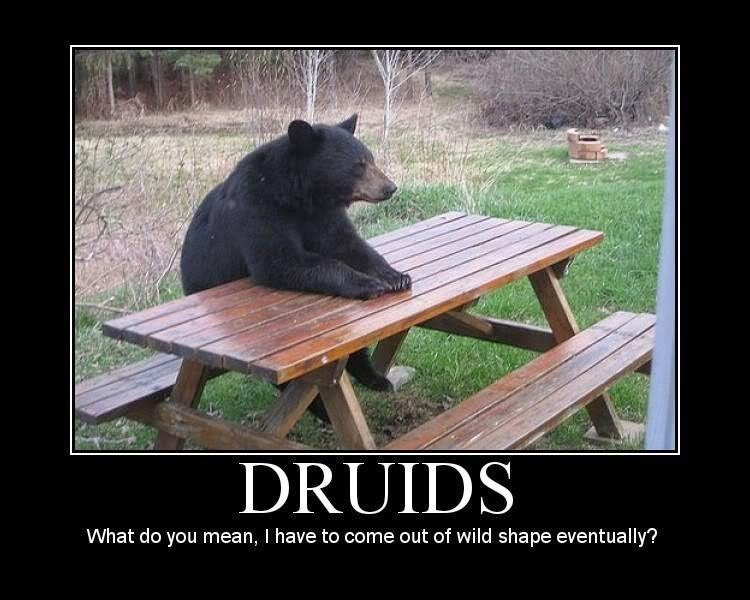 Seeing how a lot of people sing the praises of the Liberator and Warden, I got to wondering if combining the Druid and Cipher in the Oracle multiclass would at least be functional. It kinda fits with some of the ideas I've had for my Cipher Watcher from PoE1 since day 1, adding a spiritual aspect to the Cipher, without directly tying myself to the gods and stuff, especially as a Mystic from the White that Wends. The end result almost feels like a Jedi from Star Wars, using the "Force" of Soul energy that flows through and binds all living things, with a strong influence on the weak-minded! Hel, if I made the character an orlan, they could basically be Yoda! Obviously I'd be interested in following a similar route to the popular Liberator setup, using the Lifegiver Druid subclass to provide healing and defense, while the Paladin (usually the Bleak Walkers or maybe Goldpact Knights) provides the offensive might. To that end, I suspect I'd have to use the Soulblade subclass, as if I'm going into melee like a Liberator, Soul Annihilation will be an vital tool. Other than that, though, I'm not exactly sure how to approach constructing this build. What say you, the more experienced forum goers? Is this a workable idea? And what would MAKE the idea workable? Thank you all in advance! The problem with Cipher + Caster is that you don't generate focus by casting spells. Cipher really begs you to play martially with your second class. This doesn't mean you can't come up with some clever to make this work. For example, either a fury / ascendant who uses fury form to help generate focus or a shifter / soulblade that uses their multitude of forms to help generate focus. Neither of those two builds will really end up being "good" because their is zero synergy with casting spells from another class as a Cipher. Just remember that good doesn't always mean fun. There is a certain martial aspect of being a Jedi that feels lost in the idea of a Cipher / Druid. In Star Wars, a Jedi uses the force to achieve great athletic, acrobatic, and martial feats. A cipher / Paladin would actually thematically fit wonderfully, bleak walkers or darcozzi for sith and either goldpact or shieldbearer for Jedi (based on dispositions). Paladins are orders with rules on conduct, not that dissimilar from Jedi. A cruel, agressive bleakwalker / soulblade sounds like a perfect fit for Darth Vader! My impression was that you used Druid spells to keep yourself alive to hit things with your weapon, which in turn generated more focus. I mean, it's not like I'm playing PotD or anything. Edited by jtbehnke, 06 August 2018 - 08:05 AM. There's nothing wrong with an Oracle, doesn't matter if there's a lot of synergies because there rarely is with casters anyway. I played a wizard/cipher and it was strong. U could try rot skulls as a focus generator. I don't have any experience with rot skulls in this game myself but I imagine it work like blights and in that case it's not bad. In the early game the cat form spiritshift is very good and when u want to get a quick succession of cipher spells out u could spirit shift to cat and press it's self buff for a nice amount of speed. I'd rather go ascendant in that case to get the most out of it. Edited by Dorftek, 06 August 2018 - 09:58 AM. The problem with this build is the Animancer's Energy Blade is gotten way too late in the game. ...or you ignored it and focused on spellcasting and occasionally hitting things with a stick (like the Greenstone Staff in PoE1 or the Spine of Thicket Green in Deadfire). I hadn't really planned on going for it since I'd heard it can't be upgraded very much anyway. The Jedi comparison was more regarding the spiritual aspect and mental powers rather than the iconic weapon. Bit of an unrelated question: as I've mentioned on other threads, I really care deeply about my character's "fashion," being interested in creating a unified, stylish look for my character and I'm struggling to decide how to go about that in Deadfire. Especially since I won't have access to certain items in the game like the Devil of Caroc's Breastplate (since in order to have access to that, you have to lie to her and in doing so condemn more innocent people to die by her hand before she's finally killed), I'm unsure just WHAT to wear. So what do you folks say? Am I overthinking this? I thought maybe I would wear Magnera's Chain, though I don't know how well that matches the Helm of the Falcon, made of bronze rather than steel, so I might go for Okura's Kettle instead, even if it isn't better, since it may match the Chain better, and I don't want to wear The Bloody Links because it looks gross, like you don't bother to take care of the armor, and probably would look better if I was playing a psycho with Distraho. Edited by jtbehnke, 06 August 2018 - 02:23 PM. Or you could, you know, sacrifice her to Skaen. Or just outright kill her/have her die during a fight if you're anti-Skaen. I mean she IS a murderer after all. If you attack Ydwin you get it right away, as soon as you get to Sacred Stair. I am indeed anti-Skaen, and believe me, the fact that nearly all builds on this forum use some version of Effigy's Resentment kind of upsets me, but that's my personal opinion. She is a murderer, yeah, but it feels...tacky...to be the icing on the crap cake that is her life just so I can get a nice suit of armor made out of her literal corpse. For most builds it's more of a recommendation rather than requirement. A lot of the people experimenting with builds tend to be powergamers and thus try to squeeze as much as they can, wherever they can. Well, I mean technically she is already dead, her soul has just been trapped inside a metal body against her will by some crazy hermit Animancer. You could view it as a form of release for her. AFAIK if you have her spare the target in her quest, then you get the armour (and presumably complete the quest). I don't know as I've never actually done her quest; this could be what you were talking about earlier? All I know is you get the armour if you choose the "Benevolent Soul" premade history, which suggests there must be a "good" way to finish it. If not then I'm out of ideas. Edited by thundercleese, 06 August 2018 - 04:07 PM. That is correct, however the ending she gets if you do that has her continue murdering people, growing frustrated at the futility of it until finally she's cornered in a village and literally ripped apart screaming even though she isn't feeling any pain, at which point her remnants are collected to make that breastplate. I wouldn't wish that kind of emotional torment on anyone, not even a murderer. I was thinking Magnera's Chain or something like that would work okay instead, plus I just learned that it WASN'T historically inaccurate to have a metal helmet with non-metal armor, so that opens up more possibilities! Also remember that historically accurate for our world isn't necessarily historically accurate for Eora. Yeah, my point was that missing the Effigy's Resentment isn't going to render a build useless, and if it does then the build probably wasn't very stable to begin with. That's actually very reassuring. Thank you! Am I on the right track here? I fully admit I don't know what I'm doing. So you don't actually want to use Cipher powers trough most of the game? Well, I would...like I said I don't know what I'm doing...I just sort of pulled the Cipher stuff from a different build that used Cipher but had a different multiclass (Mindstalker, I think, but I'd have to double check).